SCVHistory.com | Newhall | 8th Street Home Popular with Vaudeville Greats. 8th Street Home Popular with Vaudeville Greats. 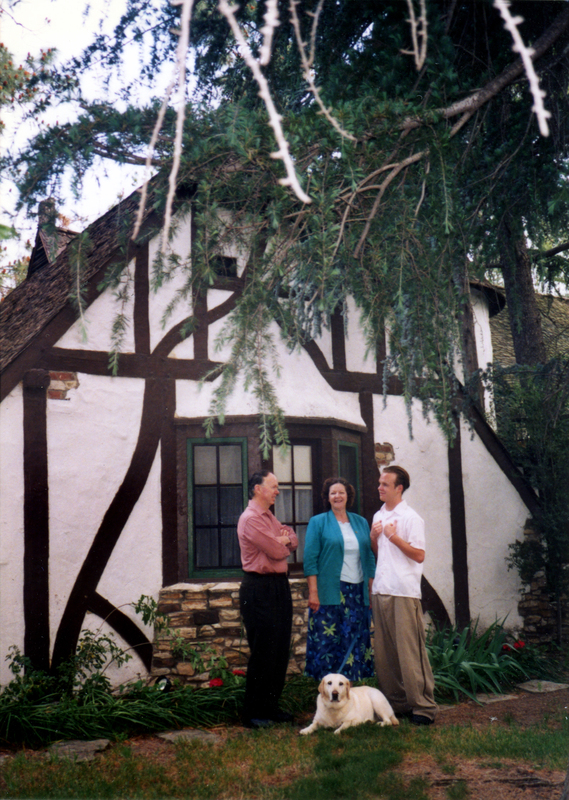 Current owners share the unique history of "The House That Mack Built" in Old Newhall. By Norman and Cynthia Harris. Old Town Newhall Gazette, Vol. 4 No. 3 | May-June 1998. 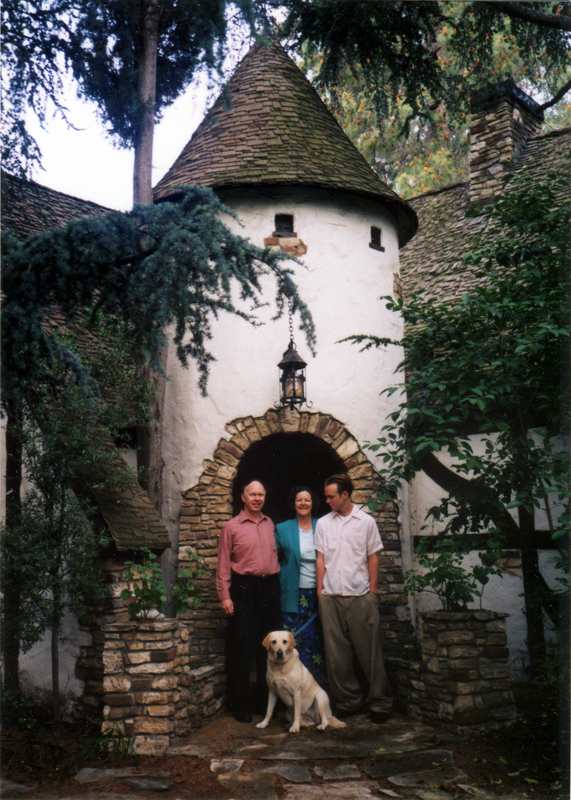 Norman and Cynthia Harris, owners of the main Charles Mack house on 8th Street, with son Howard in 1998. Click image to enlarge. "He loved life as the lion loves blood, as the sea eagle loves the sea, and as the birds love the free air. He was a Western man. Charley Mack was the greatest comedian of them all." "When he came to Newhall," Hart continued, "he looked over the beautiful expanse of this valley from my home on yonder hill and said, 'This is the place I want to live.' He found peace and contentment here. He built his beloved 'Crowland' here." Mr. Hart concluded by reminding the overflow crowd that Charley Mack wanted to be remembered as a builder: "Don't put me down as an actor," he had said, "write me as a builder." Bill Hart dropped to his knees as he led the gathering in the Lord's Prayer. Mack's casket was covered in a mountain of flowers and floral set pieces in the living room of the main house at "Crowland." A vast audience of theatrical notables, friends and neighbors filled the interior, the lawn and the grounds around the house. The date was January 15, 1934. A casket in our living room? Bill Hart on his knees in prayer? The real Harry Carey, W.C. Fields, Buster Keaton, Charlie Lamont, Scoop Conlin, Mack Sennett, Noah Beery, Jay Whidden and George Moran  Mack's Two Black Crows partner  were all here in our house and gardens to pay their last respects to the colorful comedian whose life was cut short in a tragic automobile accident. Charley Mack  whose real name was Charles Sellers  envisioned the remote town of Newhall as a retreat for celebrities. Click image for more. 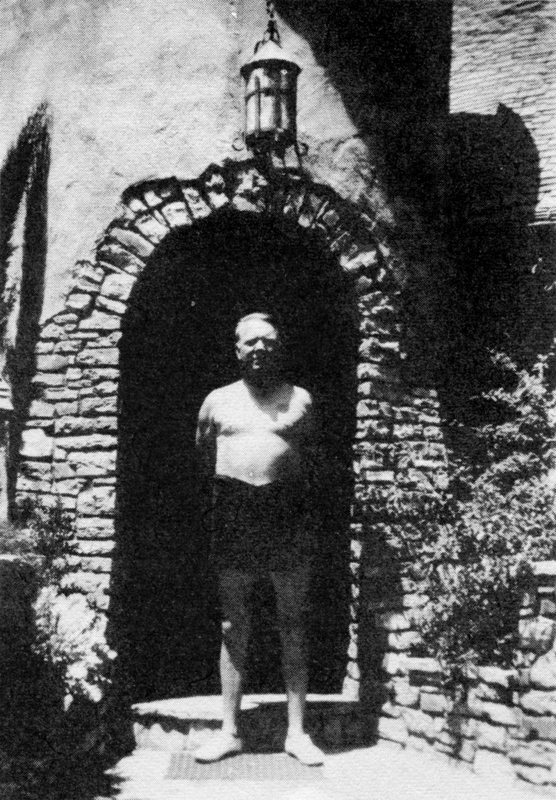 Charley Mack was one of Newhall's first visionaries who bought acreage in Newhall to create homes for the members of the theatrical profession, and "to convert the tract into a beautiful town." Mack had "visions of a valley filled with fine homes in a location away from the noise and smoke of the city, where visitors would be drawn by the beauty of the surroundings," according to a 1934 edition of The Newhall Signal and Saugus Enterprise. Mack was returning from signing a contract with Columbia in New York when he was killed in a car accident in Arizona. In the car were his wife, Myrtle; his daughter, Mary Jane; his partner, Moran; and the famous movie producer, Sennett. None was seriously injured. Charlie was crushed under the automobile and died almost instantly. Before his untimely death, the civic-minded Mack had planned to give a "big show" as a benefit to purchase playground equipment for Newhall Elementary School. Same view, minus six decades: W.C. Fields lived in the main house for a year or two after Mack's death, as seen here. Click image for more. 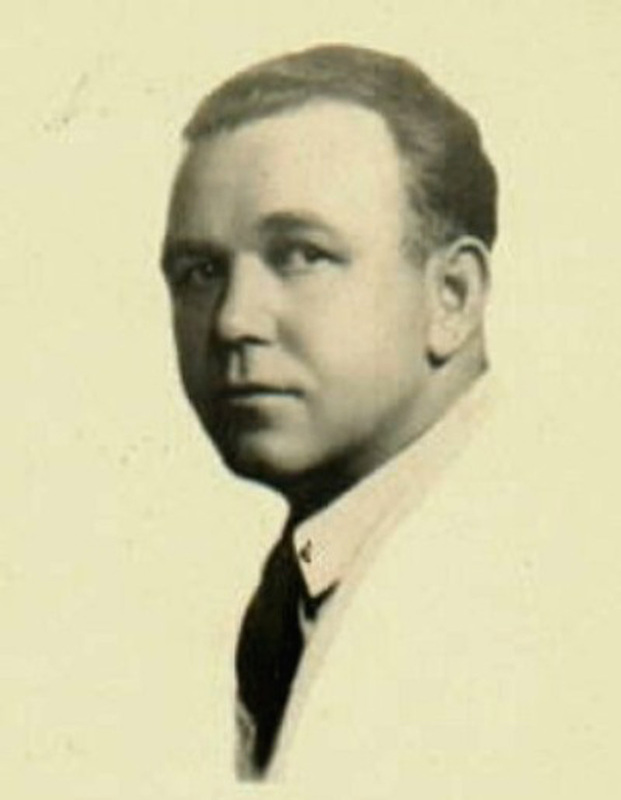 Charley Mack appeared in 18 feature films between 1921 and 1934. The most famous were the Paramount pictures, "Why Bring That Up?" (1929) and "Anybody's War" (1930), and "Hypnotized" (1931) from World Wide. Moran and Mack made many 78-rpm recordings of their comedy skits from their radio and vaudeville shows. One of the personalities who frequently traveled with the show was W.C. Fields. A fellow comedian and friend of Mack, Fields liked to spend time in Newhall. He was somewhat notorious, from some of the local stories about his visits here. Undoubtedly, his favorite room in our home was the bar. Charley Mack was famous as the "dumb" partner in the Two Black Crows comedy team in vaudeville and in the Majestic Radio Theater. However, behind this humorous façade was the innovator and creative force behind the act. Mack applied his creativity to his vision of Crowland. He selected a French Norman style of architecture and a unique landscaping design. He began construction in 1928. He was concerned with the details of the craftsmanship. All exposed beams, inside and out, were carved to appear as if they were hand-hewn, as in the original French Norman homes. There are solid oak floors and innumerable architectural features throughout the house and the pool house that are singular to the period. When the main house was completed, he built a second and third home farther up the hill, each in the same French Norman style and with similar amenities, such as the pool and pool house. 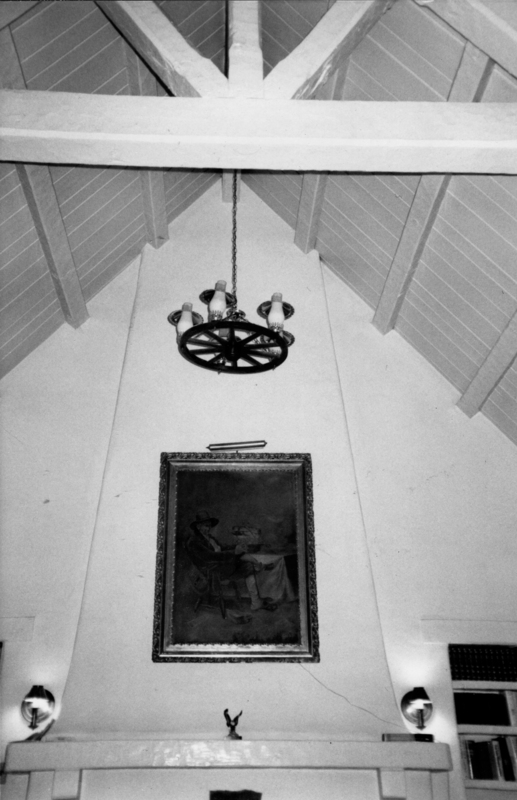 Interior detail, 1998. Photo: Leon Worden | Click image to enlarge. Evelyn and John Shifferd live in the second home, while Toni Palmer lives in the third at the top of the hill. In 1940, Ray Johnston, chairman of Allied Artists and Monogram Studios, purchased the main house. It was convenient for him to spend time there while coming back to check progress on the filming at Monogram Ranch in Placerita Canyon (now Melody Ranch). Walter and Betty Harris purchased the home from Ray Johnston in 1943. In 1981, when the Piru mansion burned to the ground, Ruth and Scott Newhall lived in our house while they rebuilt their mansion. By April of 1983 they had progressed to the point where they could return to the mansion, just in time for us to move back in and for our son, Howard, to be born. Howard is the third generation Harris to live in the house. Perhaps the spirit of Charley Mack lives on in the form of the huge black crow with the unusual white markings on its wings that frequents the tall trees on 8th Street. 1. 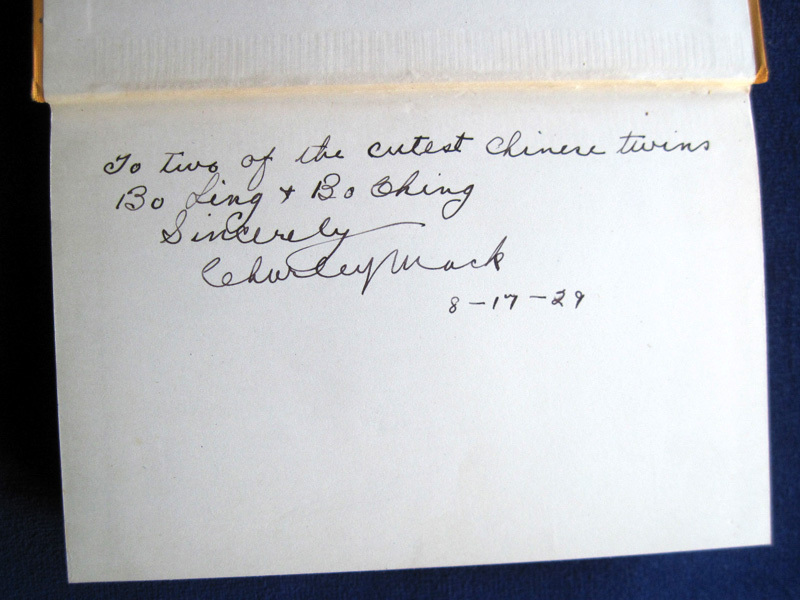 The writers originally used the form "Charlie" Mack, but he signed his name "Charley" Mack as seen here. 2. The parents of writer and current owner Norman Howard Harris. NOTE: The three Charley Mack homes in Newhall are private residences and are not open to the public. W.C. Fields photographs from "W.C. Fields by Himself" (1973), ©Ronald J. Fields, Editor, Reprinted by permission. Some photographs from the private collection of Norman and Cynthia Harris; contemporary photos by Leon Worden.